Invest Northern Ireland (NI) will host a free workshop next month to help businesses understand how to design innovative and sustainable packaging. Why should you care about packaging? Great packaging draws attention and sends a message to your customers. It helps you to stand out, and creates a connection. The very best packaging makes your buyer feel a certain way that persuades them to part with their cash without even knowing why. Packaging gives you an opportunity to tell a story, be creative and use texture, shape and colour. It tells the buyer something about you, your product and your brand. Using recycled or sustainable packaging can also communicate a strong message about your company’s ethical approach to doing business and trends show that consumers will continue to drive demand for more sensible packaging solutions as we face a growing environmental challenge. 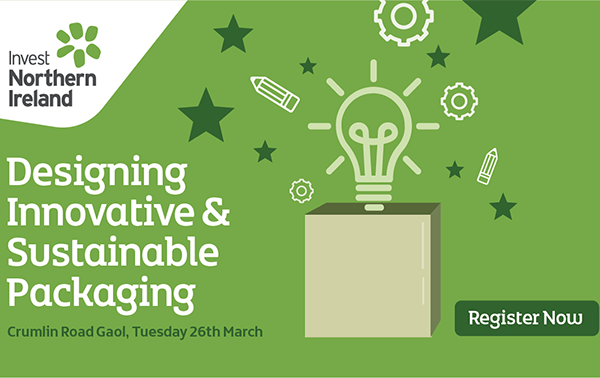 This event will show how small businesses in Northern Ireland can use innovative, interesting and creative packaging whilst considering ways to limit their impact on the environment. There will be opportunities to talk to design professionals and experts in the sustainability arena, as well as Invest NI staff explaining Innovation Vouchers, intellectual property and other support options that could help move your business forward. Register now to attend this design workshop.